Finally the power and economy you’ve been craving! DCS has taken into account all of the major steps and created a kit which contains all of the hard to manufacture & hard to configure parts. This kit is designed for the Toyota manual transmission ONLY. We process orders when we receive them, and orders placed before 2PM will usually ship same day. If you have placed an online order for one of our “Getting Started” or “Comprehensive” kits, a Sales Technician should call you shortly after your order is placed to verify your application. Diesel Conversion Specialists® manufactures a large number of the parts included in our conversion kits, but some of the items come from outside vendors. In some instances these items will be drop shipped directly from the manufacturer to expediate shipping if we do not have the part stocked in our warehouse. Returns and exchanges must be approved prior to return, and the customer is responsible for shipping charges. Returns and exchanges will not be accepted more than 90 days after original invoice. Returns are subject to a 20% restocking fee. On Cancellations, Diesel Conversion Specialists® does not refund shipping charges if the order has already been shipped. Does Diesel Conversion Specialists® just sell parts? Diesel Conversion Specialists® sells parts and our conversion shop is located in the beautiful Flathead Valley in Northwestern Montana and is able to take on most conversion projects. If you would like an estimate for a conversion, please call a Sales Technician at 406-755-8878. What makes and models can you convert? Diesel Conversion Specialists® has DIY kits for some Ford ½ ton models from 1990-1996, Ford ¾ton and larger trucks from 1967 - 2010, and Chevy/GM trucks from 1978 - 1999. In addition to these kits, we can perform almost any custom conversion in our shop. For a custom estimate, call a Sales technician at 406-755-8878. Can you help me put a Cummins into my Dodge truck or put a Powerstroke into my Ford Truck? Diesel Conversion Specialists® primarily focuses on repowering Ford and Chevy/GM Trucks. Unfortunately, at this time we do not offer parts or support for any Dodge to Dodge, or Ford to Ford engine conversions. If you would like an estimate for a custom conversion, please call a Sales Technician at 406-755-8878. Do you have a kit to help me put a Duramax into my Truck? Diesel Conversion Specialists® currently only offers parts and service for Cummins diesel conversions. If you would like an estimate for a custom conversion, please call a Sales Technician at 406-755-8878. Do you offer products for Chevy/GM conversions? Yes, we offer a wide variety of parts to match a Cummins engine to your Chevy/GM transmission. Adaptable transmissions include TH350, TH400, 700R4, 4L60, 4L80 and Allison. Check out the Parts Catalog and Kit Builder or give a Sales Technician a call at 406-755-8878. Do you have any converted vehicles for sale? Occasionally, although we have sold a couple converted trucks, our business is focused on completing the conversions and selling our DIY kits. Sometimes we do help our customers sell their trucks. Feel free to give us a call at 406-755-8878 and ask one of our Sales Technicians if we have any, or know of any available. Yes. We sell a sensor adapter kit that includes adapters to help you install the stock oil pressure and temperature sensors into the Cummins engine. The stock tachometer will work with our Tach Kit, and we include the instructions to help you get the wires all reconnected to your sensors without modifying the instrument cluster or removing the dash panel. In your 6.0L and 6.4L truck, you can also expect your boost gauge to work. Yes. Diesel Conversion Specialists® currently offers 15 different Adapter Plates that connect a Ford transmission to a Cummins engine. Modern Ford overdrive automatics are very stout and rated for high torque input making them very conversion-friendly. The 3-speed automatics commonly found in older vehicles were very good in stock applications but are not recommended for diesel conversion projects. Modern 5 and 6-speed Ford manual transmissions are also very stout and conversion-friendly for those customers preferring to shift manually. Can I put a Cummins engine in my truck that had a gas engine in it previously? Yes. 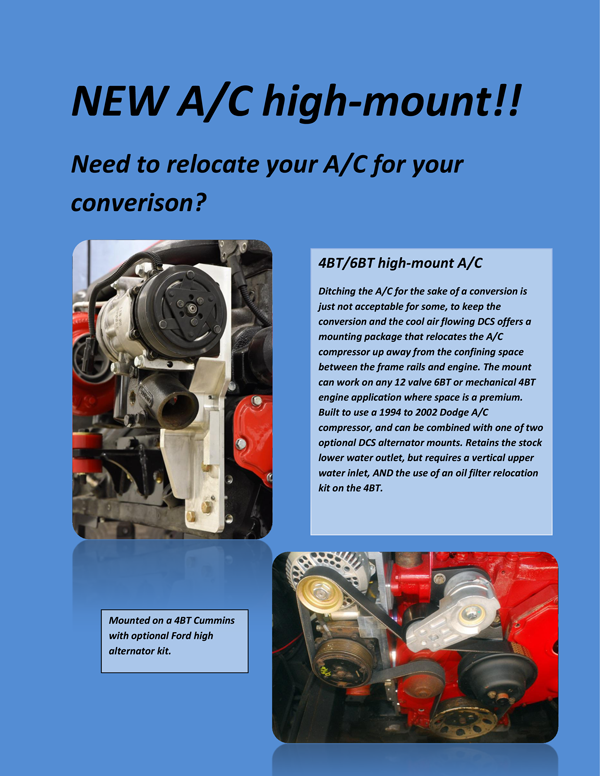 There are a few additional steps and parts needed but gas to diesel conversions are commonly done. Additional parts needed include an intercooler, larger exhaust, & possibly a diesel radiator. For automatic transmissions, an OEM diesel torque converter is needed plus you'll also need to remove the in-tank fuel pumps. What do I need to save from my Ford engine for the conversion? 6.4 Powerstroke - Engine Oil Pressure sensor, Coolant Temperature sensor, engine oil temperature sensor, Starter, alternator, Cam Sensor, Tach Sensor(if converting to commonrail Cummins), MAP Sensor, Exhaust Temperature Sensors. 1989 - 1998 12v Cummins Conversion – Conversion truck’s engine wiring harness. 94-98 Cummins Fuel Shut Down Solenoid Plug. 1998.5 – 2002 24V Cummins Conversion – Conversion truck’s engine wiring harness, Cummins engine wiring harness and Harness between PCM and Fuse Block. 2003 – 2005 Commonrail Cummins Conversion – Conversion truck’s engine wiring harness and Cummins engine wiring harness. Where do I send my wiring harness for the modification service? Do I really need to shorten/lengthen my drivelines? No, if you are comfortable running electric fans you can leave the transmission in its current location. However Diesel Conversion Specialists® recommends moving the transmission back to accommodate mechanical fans if possible. In doing so, you will need to shorten the rear drive shaft, and possibly lengthen the front one if there is a suspension lift on the truck. Can I register my vehicle in states with emissions testing? Every state has different laws regarding emissions testing and procedures. What’s legal in Montana may not be legal in California etc. The bottom line is this, we ALWAYS recommend that you check with your local and state offices to determine legality. Does Diesel Conversion Specialists® have dealer pricing, dealers or regional retailers? Diesel Conversion Specialists® does not have dealers, and is proud to offer wholesale pricing to the public without any additional sales tax. We ship parts out of our Montana offices and warehouse. ZF5 Manual Transmission - 1987-94 Rated for 420 ft./lbs. 1995-97 470 ft./lbs. The 2008 - 2010 Super Duty trucks are coil sprung for excellent ride quality and smaller turning radius. The cabin's are spacious and well laid out. There's no reason not to expect reliability in such a beautiful truck. Let's get you ready to convert. The Diesel Conversion adapter family now offers an adapter plate for the Land Rover line of vehicles. 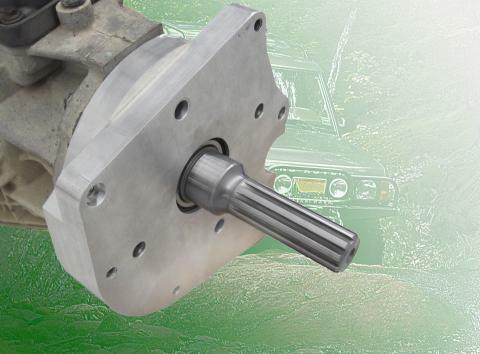 This adapter connects the NV3550 or 23 spline NV4500 transmission to Land Rover Discovery and Range Rover Classic transfer case. Part #2062 kit includes an adapter plate, carrier bearing, spud shaft and snap ring that arrives pre-assembled. For more information please see the Land Rover Overview. We now offer the option of using your Ford ® transmission control module (TCM) to control the transmission for 2003-2007 Ford diesel trucks. Understand that since the 6.0 & 6.4 engines made it's power and torque so much differently than the Cummins ® engine, tuning is necessary. Also necessary are several reproduced or intact Ford signals- so don't attempt this at home without some help. The latest news is that we now have excellent data logging capabilities that make this option available to anyone using specific years of Cummins engines. Find out more- read our Ford TCM Tuning article today! Welcome to the new home of Diesel Conversion Specialists! Please have a look around our newly-designed website, it has much to offer. Stay tuned for more content being added frequently! Please do not hesitate to contact us and let us know if you have any problems, questions, or even a suggestion. Online ordering is now available. Thanks, and happy converting! 2003-2010 Diesel trucks require use of the existing throttle pedal. Open this article to see how we identify these pedals to ensure you get the right pedal assembly in your conversion kit. Ford 5R110 custom transmission tuning is fully supported. The biggest advantages of using the Ford factory TCM is that you keep the tow/haul functions, retain your factory diagnostics with regard to the transmission, and the stock shift quality adaptive function is retained. We recommend our tuning services for the Ford TCM to assure proper transmission operation and to get the most from your conversion. Be certain to complete your conversion, per our instruction manual before driving your truck. The 1999-2003 Ford 7.3 Diesel 6-speed works well behind a Cummins engine. Ford started using this transmission in ’99. If your truck did not have one of these transmissions originally you may want to consider using a ZF6, especially if you are planning to use your truck for heavy trailer pulling. They are rated for 520 ft/lbs of torque. ZF6- Ford started using this transmission design in ’99 and they work well behind the Cummins. They are rated for 520 ft/lbs of torque. Our adapter plate for this transmission uses the Ford 6.0 starter, so no grinding of the transmission or engine block is required for starter clearance. It is possible to use the Ford 6.0 single mass clutch with our custom flywheel. Some stock application 6.0’s have a dual mass clutch these will not work. The best option is to use a Ford 7.3 ZF6 clutch with the proper flywheel all of which is included in the complete conversion kits. Whether you have a 2003-2010 Ford truck that already has the 5R110 automatic or you are considering a transmission swap- find out all the particulars on using this transmission behind a Cummins engine. This adapter plate kit uses the 6.0L Ford Power Stroke starter. This is actually the same adapter that was designed for the 6.0L 5R110 automatic transmission and it also works for the 4R100 allowing you to use the same adapter plate if you choose to switch to a 5R110. There is a split between the 6.9L and 7.3L diesel engines in the late 1980's. Using model years as a general guide is usually a good way to judge which transmission you have. However model year can not solely be relied upon. When using a modern automatic transmission behind a Cummins, aftermarket transmission control will be needed for proper transmission operation. Find out more in this article. If you have a 4-speed manual or 3-speed automatic, swapping in a 5-speed manual is something to seriously consider. The earlier transmissions were tough, but they simply were not designed for the torque the Cummins engines produce. Their input shafts are smaller, the clutches are smaller, and without an overdrive you will lose all reasonable fuel economy at highway speeds due to running the engine at such high RPM's. Some guys say the Ford ZF-5 is a better transmission than the Dodge NV4500 and others say just the opposite. That debate aside; from a conversion standpoint the ZF-5 is better and easier- this article explains why. Open this article to see how full power screw, fuel pin, governor spring, and smoke screw adjustments can wake up your first gen Cummins. Are you having trouble with your 89-93 Cummins? Check out this section for some help! If you are having trouble with the 1994-1998 12 valve Cummins, reading this article may save you some time and frustration. General Diesel Performance Tips- this is Performance 101. Diesel Conversions® provides this information as a guide to help you plan what components you will need to complete your project and also to define descriptions for the parts that are referred to in our sales information and in the installation manuals. If you are considering using a Common Rail Cummins engine in your conversion project, read this article for valuable pre-sales information. If you have a 2008-2010 Ford® F250 - F-550: 5.4 or 6.8 gas-powered pickup, this article will help you understand what it takes to install a Cummins® engine in its place. If you have a F-450 - F-550 here are few tips to consider before doing a Cummins conversion. The Ford® Super Duty® 6.0L trucks are the easiest trucks to convert to Cummins® power. No modifications to the firewall, core support or floor pan are necessary. Find out just what it takes and order your kit today! Many times customers ask about converting 1999-2007 Ford® 5.4 and 6.8 trucks to a diesel due to the fact that they can be purchased reasonably, or they already have one and would like diesel power. There is not too much difficulty with this conversion, as these trucks will accept a diesel super duty intercooler without modification and the frame and transmission mounting is the same as the diesel versions. So turn that gas burner into a diesel truck! The Ford® Super Duty® 7.3L trucks are one of the easiest trucks to convert to Cummins® power. No modifications to the firewall, core support or floor pan are necessary. The stock radiator and intercooler can all be used as is with the Cummins engine, and the fan shroud usually works with only minimal modifications. Read the overview for more information. A Cummins in a 1980-1997 Ford? Yes we have the parts and knowledge to help you convert your truck - find out more. Find out what needs to take place so you can install a Cummins Diesel engine into a 1967-1979 Ford® pickup. There are a lot of older model GM trucks on the road that are prime for a conversion. Our conversion kits supply the difficult to manufacture hard parts, all connected to a technical know-how support staff that’s a phone call away. We can even offer suggestions for sourcing the remaining items. To begin with, this won’t be an extensive overview as we just haven’t had the opportunity to explore all of the possible fitment options. We developed the transmission-to-transfer case adapter to leave the engine options as open as possible. Put in a 3.3 Cummins, a 5.0 Ford or a big electric motor—the limits are yours. Diesel Conversion Specialists works hard to provide high quality, conversion friendly, engines for a reasonable price. In today's market the term "remanufactured engine" can mean different things and often times will leave you on the hunt for new or used parts to complete the engine build. Purchasing a conversion friendly engine ensures you get the right engine for your conversion. We always have a healthy stock of engines and are never more than a few days away from having an engine ready for you. If you require a custom built engine we offer those as well. Anytime you purchase an engine and conversion kit from DCS we dress the engine with as many conversion parts as possible. Not only does this save you wrench time, if you have your old engine removed, your DCS refit engine will be drop in ready. We have a rotating stock of engines and often sell them more quickly than we can update the website. Give us a call for pricing and details.